Flammable liquid: Is a liquid with a flashpoint below 100° F. Flammable liquids are classified into classes: Class IA, IB, or 1C liquids. Flammable liquids are present in almost every manufacturing facility and workplace. Any liquid that is flammable such as: gasoline, diesel fuel, cleaners, adhesives, paints, polishes, and many more can be considered a flammable liquid. There are many uses for flammable liquids depending on what the specific flammable liquid chemical is. See the table above for classification purposes. The storage of flammable liquids is very important and if stored improperly, they can become a risk to surrounding areas and individuals nearby (depending on the quantity of the flammable storage). Flammable liquids should be stored in a fire-rated or explosion proof flammable liquid storage building. Ventilation is not required unless the flammable liquid calls for it or the municipality or other government agency specifically requires ventilation. 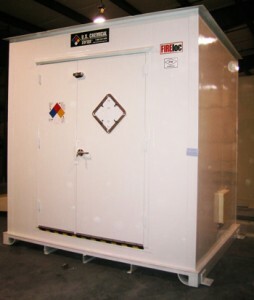 U.S. Chemical Storage provides fully customizable flammable liquid storage buildings. Our flammable chemical storage buildings are 100% compliant for all your flammable storage needs. Offering safety and protection to your investments, personnel and facility. Our flammable liquid storage buildings are constructed from extremely strong metal steel for maximum protection. Keep your flammable chemical storage safe with a flammable chemical storage building from U.S. Chemical Storage.